Choosing a citrus-y orange color for the walls of our guest bedroom has turned it into what we call the “Florida” room, with cornflower blue and white as the accent colors. A modern style bed quilt has been on my “to do” list for quite some time, so I put the colors together and followed a design found on Nancy Zieman’s web site, called The Quilt to Give. I am not a fan of making large quilts, but decided to “stretch” myself a bit this year and learn some of the traditional quilting processes. Strip piecing is certainly an easy place to begin, especially when it is a quilt-as-you-go project. However, managing the backing, batting and strips all at once can be a challenge. I basted (by machine) the backing and batting every 8 inches vertically before I started to add the strips (at the center). 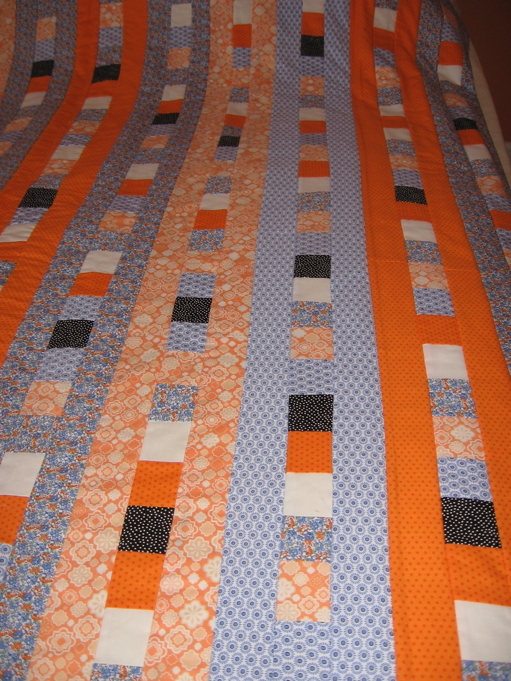 You can see a bit of the process and the almost completed bed quilt in the pictures below. I still plan to add some overall quilting using my mid-arm Handi-Quilter, but it was a “quilt as you go” design, so the first level of quilting was completed as the quilt was pieced together. Additional quilting is optional, and I hope to soften the overall colors by added some overall quilting with a white thread. Enjoy! Above photo shows the strips on the design wall as the planning is underway. 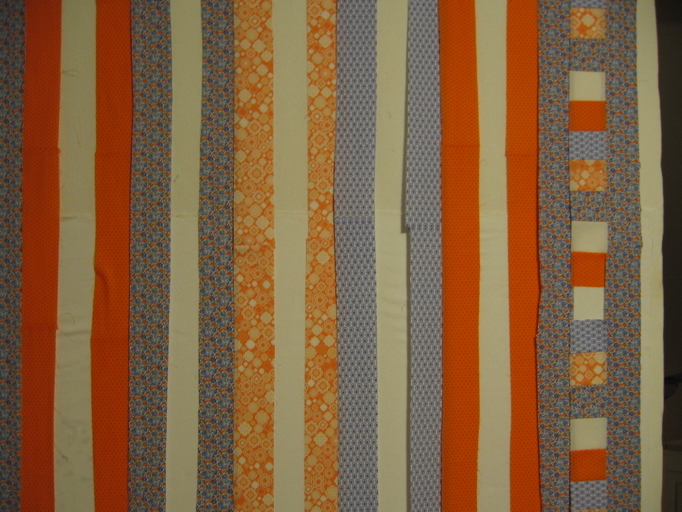 In the photo below, the strips have been sewn together with the batting and backing in place. One strip is placed on top of the batting and backing with another strip on top, right sides together. Then a seam is stitched the full length through both strips. The strips are folded open and pressed, with another strip added, right sides together, at each raw edge…. continuing until the quilt reaches the desired size. 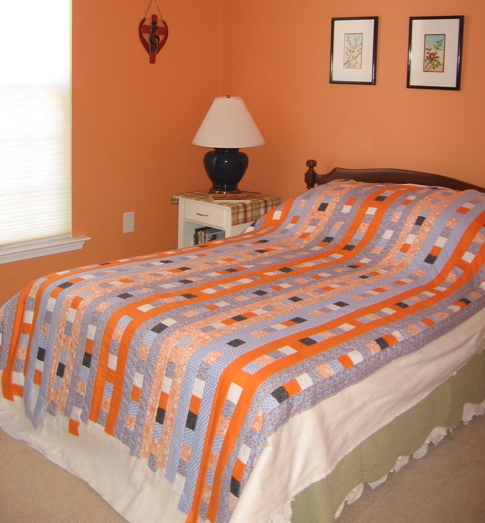 In the photo below, the quilt is being auditioned on the bed to determine how much bigger it needs to be. The “inventive orange” walls which provided the incentive for the colors give you an idea of the setting where it will be used. More pictures to follow when it is fully quilted and completed. This entry was posted in Copyright© 2009 All images and text in all categories are copyright of Mary A. Ritter (aka M'Unique) and may not be reproduced without express permission., Fiber Arts and tagged blue, citrus, cornflower, florida room, orange, quilt-as-you-go. Bookmark the permalink. I really like your fabric choices for this project. I have to retread your instructions so I “get it”; I’m in the mood to make a larger project that has visual appeal but is quick! This pattern fits the bill nicely. Hi Sharyn! Good to hear from you. If you click on Nancy Zieman’s link for the Quilt to Give (above), I think she has a free pattern and directions that may be clearer than mine. Hope to see you around the Preserve. That is so beautiful! I’m always so impressed with all your projects. What an artist you are!